Drive better results from your innovation program with the Innovation Performance Framework® – a proven approach for developing organizational innovation capability. 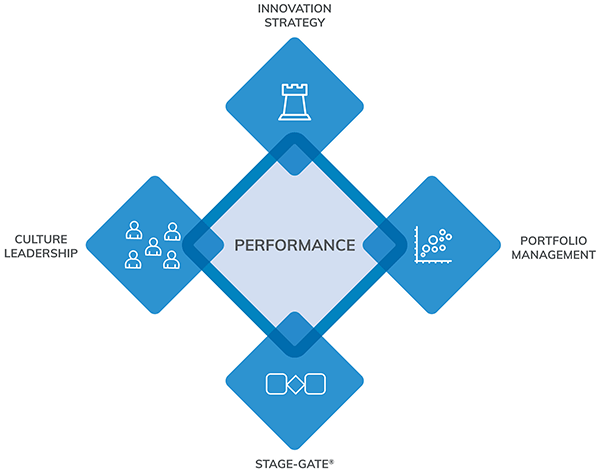 Developed through extensive benchmarking studies, this framework isolates the 4 key drivers that impact innovation performance: Innovation Strategy, Portfolio Management, Stage-Gate® Process and Culture Leadership. Companies that establish strong capabilities in each of these 4 drivers realize better performance from their Innovation Program. An Innovation Strategy supports the achievement of business goals and guides new product development investment decision making. It is how the leadership team communicates the strategic arenas of focus for the company’s innovation efforts – the products, technologies, and platforms that will drive the business forward. Innovation Strategy governs which projects are selected and how resource allocation decisions are made. What are the 6 elements of an Innovation Strategy? Portfolio Management allocates resources to the right projects to achieve the Innovation Strategy. Leadership teams strive to optimize and allocate resources to maximize the value of their new product development portfolio. It requires good strategic and tactical portfolio management practices. Strategic Portfolio Management ensures that new product projects are balanced and aligned with the innovation strategy. Tactical Portfolio Management ensures the projects selected are of high-value, prioritized and have sufficient resources for successful execution. What are the 4 goals of Portfolio Management? The Stage-Gate Model is a holistic big picture view of the idea inception to launch process that enables optimal innovation management to realize more rapid, profitable, and successful new product development. At Gates, rigorous project investment criteria are used to evaluate projects individually and cross-functionally to yield effective Go/Kill decisions. Poor, off-strategy, projects are screened out. This helps focus scarce resources to the right projects, in the right arenas to achieve the innovation strategy. How does the Stage-Gate Model work? Culture Leadership drives sustainable innovation excellence. The senior leadership creates a positive culture for innovation and entrepreneurship, fosters an effective cross-functional approach, and is engaged in the new product development decision making process. If innovation is critical to achieving the company’s growth strategies, the best people need to be involved and supported by the leadership.